WINTER CHALLENGE LADDER REGISTRATION IS NOW OPEN! 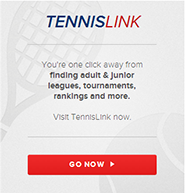 SIGN UP TODAY FOR THE WINTER CHALLENGE LADDER AND KEEP YOU GAME IN SHAPE FOR SPRING TENNIS!!! Click on the menu rail to the left for all the details.